When you travel to Kyoto, you shouldn't miss any chances to 'go green'. Yes, i mean, to drink matcha and eat matcha flavor everything. There are tones and tones of tea shops and dessert shops in Kyoto, i too encountered difficulty times to pick the best one. The best solution is to try as much as possible, and you will find your favorite. Marukyu-Koyamaen(丸久小山園) is one of the best matcha sellers in Uji, where is only 30 mintes away from Kyoto by train, it is matcha's hometown. Besides its producer, and a counter shop in Kyoto station, Nishi-Notoin (西洞院店) branch is the only cafe runs by the company. 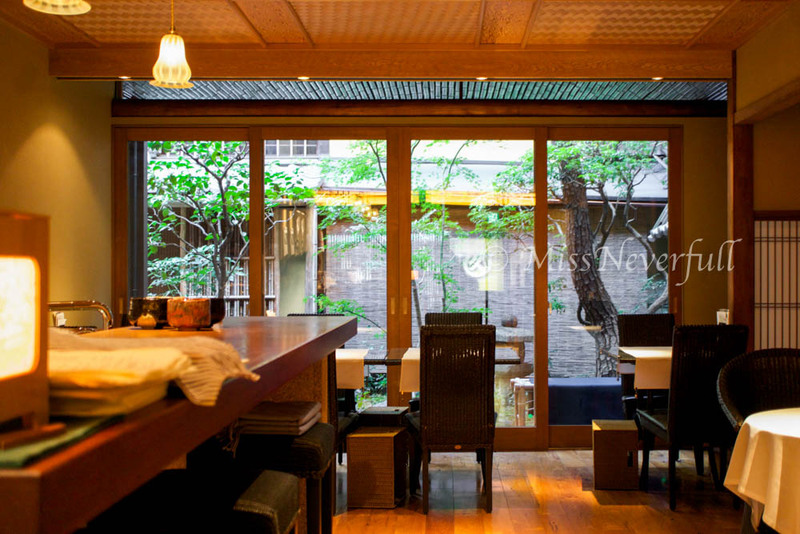 Facing a small Japanese garden, the cafe gives a very zen and elegant feeling. There are only 4-5 tables, 1 private room and 3-4 counter seats inside, so get ready to wait for a while during peak hours. The menu offers a wide range of freshly-whisked matcha, and matcha drinking, as well as few matcha desserts. What i came for is their matcha cake roll. What i recommend here is to get the Matcha Roll Cake Set (JPY 1,200) which comes with your choice of matcha, sencha, hojicha, gonmatcha, sweetened matcha, matcha doba, matcha latte or black tea. As this shop is famous for matcha, i picked the hot matcha. The cake was terrific - i swear it was the best i have ever had. Very fluffy and light sponge, the milk cream was very refreshing, and matcha cream has a deep flavor. The entire piece left a lovely sweet and bitter aftertaste. It was so wonderfull that i couldn't find any more words to describe. Please go try by yourself. After the cake, a small cup of green tea was served. I finished two servings of Matcha roll cake by myself, it is just soooo worth the calories. (It is really light and not too sweet, you won't feel too guilty though)! And i bought tones of their cookies and matcha back to Kyoto, everything is so good from this shop. Would LOVE to come back!